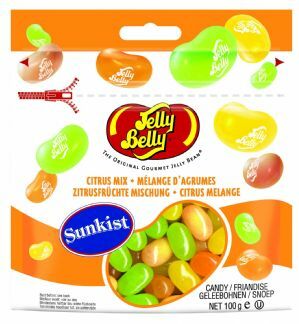 Jelly Belly Jelly Bean Sunkist Mix 100g Bag. 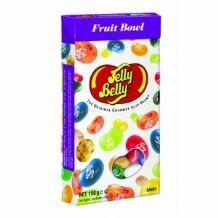 Gourmet Jelly Belly Jelly Beans. Sunkist Citrus Mix from the flavours of the soft drink. Ingredients: sugar, glucose syrup, modified corn starch, E325, E330, lime juice concentrate, lemon puree, glazing agents: E901, E903, E904; grapefruit juice concentrate, flavourings, orange puree, tangerine juice concentrate, ascorbic acid, colour: E100, E102, E110, E129, E132, E133, E171; ;.